“Millennials” is a favourite demographic for businesses to target, thanks to the influence and spending power of this generation. It is, however, a very broad term for an audience which has seen the most rapid changes in technology and social interaction than any other generation. Notorious as the ones born to use smartphones, how does print fit in with millennials? Turns out, it actually fits in very well: millennials are the very reason that print has been rescued from the predicted downfall in the digital age. 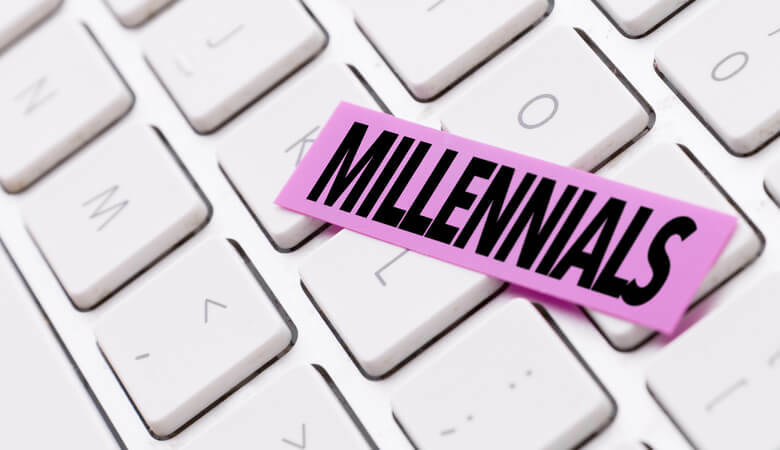 A common misconception about millennials is the idea that they only respond to digital marketing, but in fact they are far less trusting of any online media compared to print. The broad term covers a wide age range, with most sources agreeing that the ‘millennial’ generation spans from the 1980s with an end date between 1997 – 2000. These are the people driving modern culture: they are the first digital natives, changing how we interact with business, choose our purchases, and how influence changes in the social circle. This is the generation of ‘social influencers’, where millionaires are made from the number of Instagram followers or YouTube subscribers an individual has on their page. The social buying mode of this generation is the strongest ever seen: purchases are 74% more likely to be made by word-of-mouth recommendation (including 43% from direct social media referrals) than any other purchase decision driver. Where it used to be one friend recommending a product to an individual friend, nowadays a quick status update on any number of social media platforms can broadcast a recommendation to thousands. As 68% of buyers feel that online consumer opinions are strong influencers in their buying decisions, the power of the digital native cannot be ignored by marketers. What is most interesting about this behaviour is that 88% of people will trust online reviews of strangers as much as they will from personal friends. The social influence doesn’t stop at consumer buying anymore. This generation will make up more than 50% of the working population by 2020. That’s only three years away! Marketing to millennials isn’t just about consumer products anymore: they now make business purchase decisions, too: word-of-mouth referrals account for 91% of buying decisions in a B2B environment. Whether your company is B2B or B2C, it’s important to understand the needs and wants of the generation with the strongest influential power in buying trends. Even if they aren’t your target audience, consider the buying power and personal influence of this age group: they’re either going to grow into your target audience age bracket, or positively influence trends for the upcoming Generation Z. With the huge influence of social and digital platforms in referral marketing, it’s easy to assume that it’s the best (or only) way to approach marketing to millennials. However, recent studies suggested that a balance of on and offline marketing is the best way to target the millennial demographic to manipulate a purchase decision. In fact, as 84% of millennials don’t trust traditional advertising, it’s only the integrated on- and offline strategies that they are likely to pay attention to. A smartphone-happy twenty-something is going to skim past your digital banners, instead paying more attention to a printed postcard… but then will use that smartphone to research the product further, compare prices, find reviews, and make the purchase. Digital media can be obnoxious, invasive, and demanding. Millennials have grown in a world where it’s easy to tune out a radio ad, skip after the first few seconds of a YouTube commercial, or hit the X on a Lightbox pop-up. The mistrust of this 84% of the millennial generation when it comes to digital marketing stems from one crucial thing: they want to buy from brands that feel authentic. - Madeleine Park, Franchise Marketing Coordinator for Maid Pro Franchise. Print media provides a tangible connection. People can choose when to interact with it: if the time they receive it isn’t quite right, that doesn’t mean it won’t be consumed at some point. Print media allows people to read it in their own time, on their own terms – making messages much more likely to be absorbed. Direct mail has a big influence with buying decisions of the millennial generation. A whopping 92% have said that they have been influenced by direct mail to make a purchase decision. It’s all about how you use your print marketing to tie into your digital strategy: this generation spends more free time researching purchases online than any other. Print doesn’t stand alone anymore, but with 82% of 18-34 year olds saying print influences their buying journey, it’s still essential. Combining print and digital will drive the sales cycle for you from offline to online, completing the circle of personal touch through to online purchase – both of which are the millennial preference. Perhaps most importantly, innovative print media and designs are what create their own online buzz, drawing attention to the brand without a hard push on your digital marketing. A nifty piece of print media is likely to be photographed and shared on Instagram or Snapchat, which is shared by friends, then friends of friends, and suddenly it appears in a ‘listicle’ article on a website such as Buzzfeed, and sales soar. All because of a piece of offline print media. - Brad M. Shaw, President and CEO for Dallas Web Design. Students have expressed their reluctance to turn to e-readers for their study time: 92% still prefer real books. While you can highlight and annotate digital versions, there’s just something different about a physical book. This is just one example from many to demonstrate why millennials (and the younger Generation Z) are pushing print to new horizons. Whereas Baby Boomers predicted the downfall of print once the smartphone generation came of age, younger people have bucked the trend. campaign gives value to the individual. - Darren Green, Managing Director at Roman Blinds Direct. It’s all down to wanting more experiences in life. Millennials are undoubtedly glued to their technology most of the time – but it’s this deprivation from real-life connections that make experiences even more valuable. In fact, spending on experiences has increased by 70% as a relative share of consumer spending since 1987. Strongly linked with experience is emotion. It is much harder to feel emotionally connected to an intangible digital presence than it is a physical piece of print. People like to be able to hold something in their hand, and it’s been shown to connect with areas in the brain related to emotion and impulse unlike digital products which cannot be touched. Recent research found that millennials would rather have a physical invitation, card, or letter from a friend than an e-invite or social media message. Having a tangible connection with anything – a friend or a brand – strengthens the emotional impact of an interaction. This is especially true of personalised print media: in an age of junk email, millennials are used to pressing delete. However, personalised direct mail – which could be something as simple as being addressed by their first name – is not only a novelty in the digital age, but helps create a physical connection with a brand. Using emotion to drive your marketing is absolutely key to ensure your product and service resonates with your audience as closely as possible. If your target demographic falls into the ‘millennials’ bracket, it’s time to take this on board: your audience want real things. A great example of the emotion tied with a product is the success story of Tom’s shoes. The concept is simple: for every pair of shoes purchased, the company will donate a free pair to a child in need. Buyers are driven not just by an aesthetic, but the motivation to feel good by doing something good with a purchasing decision. Toms Shoes prides itself on the 'one-for-one' policy: you buy a pair, they give one to someone in need. The environment is a great example of how you can improve your credentials with your millennial customers: if you use suppliers that are eco-friendly, ISO 14001 accredited, or fair trade, brag about it. This generation cares about the environment more strongly than any previous generation, and the emotional element is something you can use (as well as reducing your own carbon footprint etc at the same time!). It’s not just the environment that will motivate a purchase decision from a millennial: it’s all about how your product provides a solution. A defining feature of the millennial generation is that age doesn’t hold as much weight anymore. The expansion of global communications has enabled this generation to connect with people all over the world who have common interests, rather than simply a similar age to others. The millennial generation don’t readily identify themselves as such; instead they choose to find characteristics to align with a certain ‘tribe’ instead. You have the hipsters, the nerds, the rock climbing outdoorsy type, the minimalist, the social media socialite, the Youtube vlogger… the list goes on. More broadly, this can be broken down into tribe personality type, such as the Lone Wolf, New Traditionalist, or Engaged Idealist as examples. Your product or service will speak to one of these tribes more than others. The way each tribe engages with brands is different, as their motivations are varied and this is what separates the groups from each other. Critical Counterculturists, for example, will respond to more politically strategic marketing (such as promotion of human rights charities), while a Lone Wolf is more likely to impulse buy if they are left to make an unpressured choice. When marketing to millennials, using the common interests is more powerful than targeting by age. Many millennials feel that they are not as far in life as they expected to be by their age – thanks largely to the global financial crisis which raised rents, lowered incomes, and reduced opportunities for growth. A disgruntled generation, millennials want to be engaged with, rather than talked at. That’s why identifying your tribe is essential if you want to have millennial marketing success. Print clearly has a strong resonance with today’s digital generation. It can drive online purchases (by up to 92%) and direct mail has been shown to influence a significant majority of buying behaviour. 1. Remember: embrace the emotion! A great, yet simple, way to connect with your customers is to send handwritten notes. Perhaps you want to send them personalised birthday cards, or a thank you for their first purchase. 2. A little hint: everyone has their inner child that cannot resist a good sticker or two. Slip a few into your correspondence or packages, and they’ll be put in all manner of places for some guerrilla advertising. 3. Only 19% of millennials feel that they have the money to afford the life they want and need. Use this in your favour by printing discount vouchers, coupons, and loyalty cards to tap into the spendthrift mindset of a generation that grew up scarred by the noughties’ financial crash. 4. Remember that the millennial generation are digitally savvy: they can look any problem up online to find the solution. That means they aren’t interested in what product or service you have: they want to be told how it solves a problem. Make this your key angle when using direct mail or printed media, and you’re sure to see a positive response from this vital customer demographic. 5. Tie your print media with your digital strategy in order to drive people online to complete the typical buying cycle. Few millennials make in-person purchases from direct mail, but will go online to complete the buying process. Whoever your target tribe, if you spend time trying to understand them instead of broadcasting to them, you’ll find success in your millennial marketing ambitions!